As well as Certificated Location (CL) owners, we are active caravanners and make a point of using CLs, partly to support the network, but mainly because of child road-safety: we have a young son and it stands to reason that CLs with only 5 caravans will have a lot less traffic than large commercial sites. Our own caravanning has shown us the tremendous variety amongst CLs and we offer this page as advice based on our experiences. We have realised the Caravan and Motorhome Club is a canny organisation and Club sites tend to be in places where there are lots of local attractions. On that basis, we tend to choose CLs that are near to sites operated by the Caravan and Motorhome Club. We talk to other caravanners and ask their recommendations. This can be face-to-face or on internet caravan discussion groups. We do a lot of internet research so that we have a priority list of local places to visit. We read the Caravan and Motorhome Club magazine (and keep back-issues on file). We ask the CL owner for local recommendations. The CL search on the Caravan and Motorhome Club website has a tick-box for ‘Dogs Allowed’. We are used to a quiet life in the country and like the same when we go on holiday. In the Caravan and Motorhome Club Sites Directory, some sites will claim to be quiet: this is a good start, but experience has taught us that other people’s idea of ‘quiet’ is different from our own. The CL that comes to mind is the so-called ‘quiet’ CL adjacent to a London commuter railway line and in the flight-path of a major London airport! We avoid Pub CLs, as even with quiet country pubs, there will be a certain amount of noise and car door slamming at closing time. CLs with DIY livery yards tend to be noisy and have lots of cars as horse-owners visit once or twice a day to feed and muck-out their horses, often early in the morning. Working farms can be noisy, but not always the case, so worth asking the owner. If the Sites Directory is marked ‘working farm’, we generally take that to be a warning of noise. Having experienced the luxury of electric hook-ups, we would rather travel a bit further than use a CL without hook-ups. As well as convenience, it means that we are not troubled by noise from electricity generators. 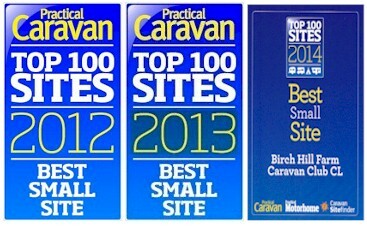 A quick way of narrowing-down sites with hook-ups is the CL listings on the Caravan and Motorhome Club website. We don’t like being crammed into tiny CLs. Sizes are shown in the Caravan and Motorhome Club Sites Directory, and our preference is for CLs of at least three-quarters of an acre. Not essential, but a nice bonus. In the Caravan and Motorhome Club Sites Directory, some sites claim ‘views’: this is a good start, but experience has taught us that this can be the view of an estate agent – good in one direction, but close to a line of electricity pylons in the other direction. Online maps and aerial photographs can help. CL owners do not have to be caravanners or members of the Caravan and Motorhome Club, but if they are keen enough to join, they may be experienced caravanners, and the CL should be ‘above average’. A way to tell is to look at the CL entry on the Caravan and Motorhome Club website or Sites Directory & Handbook. ‘pt sl’ for ‘part sloping’ – in our experience, this means very sloping and may limit the position of the caravan. ‘sheep or poultry on site’ – difficult to keep the caravan clean with a small child wandering in and out of the caravan with guano or sheep poo on his shoes. ‘working farm’ – possibly noisy or dangerous with tractors and other mechanical equipment. Extra care needed to stop children wandering. ‘NMW’ – Non-Mains Water – our personal preference is for treated water as we feel that it is safer.